The United States dared to permit itself renewed hope on Thursday that the longest war in its history may be closer to a negotiated settlement, after Afghan-led talks went better than expected. After 17 years of guerrilla conflict and several diplomatic false starts, American officials take nothing for granted ─ and they still expect the spring thaw to herald more fierce fighting. But they were pleased, both publicly and privately, by this week’s international conference in Kabul, which they see as a step towards talks between President Ashraf Ghani’s government and the Taliban. Ghani played his role to a tee, holding out his hand to the Taliban and suggesting that if they join talks they could be recognised as a political party with a legitimate role in Afghanistan’s future. Washington, even under war-skeptic President Donald Trump, will not seek a unilateral deal with the Taliban to extricate itself from the long, inconclusive conflict, but will instead encourage an Afghan dialogue. And, just as US policymakers have concluded the still improving US-backed Afghan military cannot win a decisive victory, they now believe the Taliban must understand it will never retake Kabul. Much could yet go wrong, and US officials are keen to insist that their remaining forces in Afghanistan will continue to support Kabul’s troops and target extremists until conditions are ripe for peace. But ─ in Kabul and in Washington ─ they are permitting themselves a measure of satisfaction that Trump’s vaunted South Asian strategy has begun to gain traction with Kabul and regional players. Since a US-led intervention in Afghanistan in the aftermath of the September 11, 2001 attacks overthrew the Taliban regime, the militant group has been under pressure to renounce its hardline ideals. But Ghani and US officials now accept that the Taliban can enter peace talks without first accepting the country’s new democratic constitution and its protections for women and minority groups. The hope is that the group will definitively split from internationally oriented extremists like Al Qaeda and find a role in a new Afghanistan, with an evolving constitution ─ as the “end condition” of talks. “Along with that there has always been the understanding, even the expectation, that constitutions are living documents,” one senior US official told AFP, predicting that compromises would be made. US officials were also pleased that, during the two-day meeting with world and regional powers in Kabul, President Ghani was restrained in his criticism of Pakistan. Washington shares Kabul’s intense annoyance at Pakistan’s alleged support for the Afghan Taliban. Some of Ghani’s previous angry speeches have antagonised Islamabad, which denies such accusations. Under Trump’s predecessor Barack Obama, US commandos infiltrated Pakistan to kill Al Qaeda leader Osama bin Laden. Now, under Trump, Washington has delayed billions of dollars in aid and advanced equipment for the Pakistani military in order to underline its anger at the alleged support for militant groups. 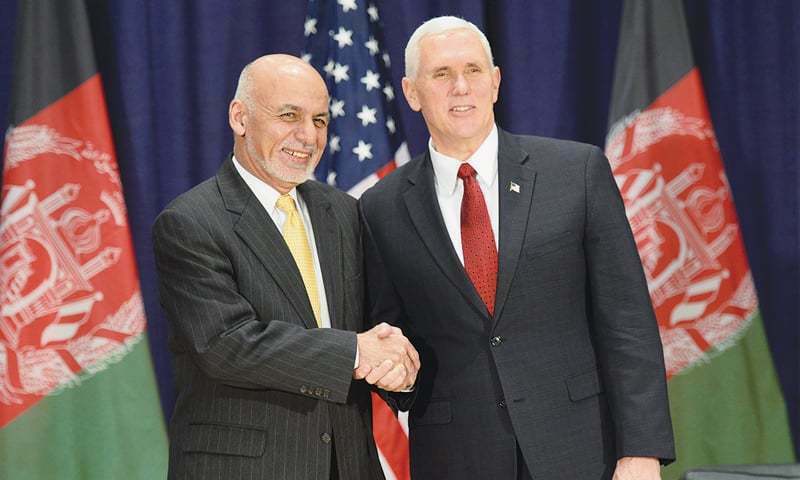 But the US also wants Kabul and all the regional parties to the dispute to sign up for the peace process, and they were heartened that the Kabul talks passed without a major Afghan-Pakistan row. The Taliban, of course, did not attend the Kabul talks ─ indeed they condemned them ─ and instead issued a letter calling on the US to negotiate directly with them an end to fighting. For Washington, however, this is seen as posturing. There’s no question of a unilateral deal to exclude the central government, and Trump has signed off on an indefinite “conditions based” military presence. The senior official ─ pointing to what US ambassador John Bass hailed as Ghani’s “very courageous stand” ─ admitted that he and colleagues following the long conflict are prone to skepticism.